Living… alone in Pittsburgh where he works as a TV weatherman. Visiting... Punxsutawney, PA to report on Groundhog Day. Phil would rather be anywhere else in the world, but he can’t leave. 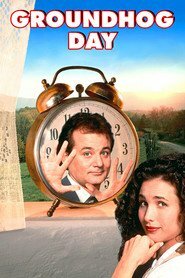 No matter what he does, every day starts the same way – in his hotel room in Punxsutawney on February 2nd, Groundhog Day. He can’t imagine a worse place to be stuck. There are only fourteen bars, the weather is terrible, and he can’t escape the worshipping of that dirty, dirty rodent. Interests... himself mostly, but now that he’s stuck in a time loop he’s got plenty of time to cultivate new interests: piano lessons, learning French, ripping off armored trucks – even killing himself. He lives in a world without consequences, where no matter what he does he’ll wake up in the exact same place. This freedom might be exhilarating to some, but for Phil, being stuck in Punxsutawney is as bad as purgatory. Relationship Status... single, but obsessed with his producer Rita. As Phil describes it: "I dream of her every night of my life. She's been my constant weapon against total despair, and just knowing she exists has kept me alive.” Unfortunately, Rita doesn’t feel the same way. She thinks Phil’s an arrogant, boorish, and miserable cynic. He has only 24 hours (but infinite tries) to undo his horrible first impression and convince Rita to fall for him. Challenge... finding some way to exit the time loop he is stuck in. But with no guidance as to what’s happening or how it can be stopped, Phil’s major difficulty is staving off boredom, and finding increasingly interesting ways to spend February 2nd. Personality... arrogant, selfish, and unappreciative. Phil Connors is a nightmare to work with. Fixated on professional success, and lacking consideration for those around him, Phil was set in his ways – but now that he’s being forced to stay in the same place; to interact with the same people, go to the same places, and never move forward – he may finally be forced to change his ways and stop being such an insufferable jerk. Phil Connors's popularity ranking on CharacTour is #1839 out of 5,000+ characters. See our top-ranked characters and read their profiles.